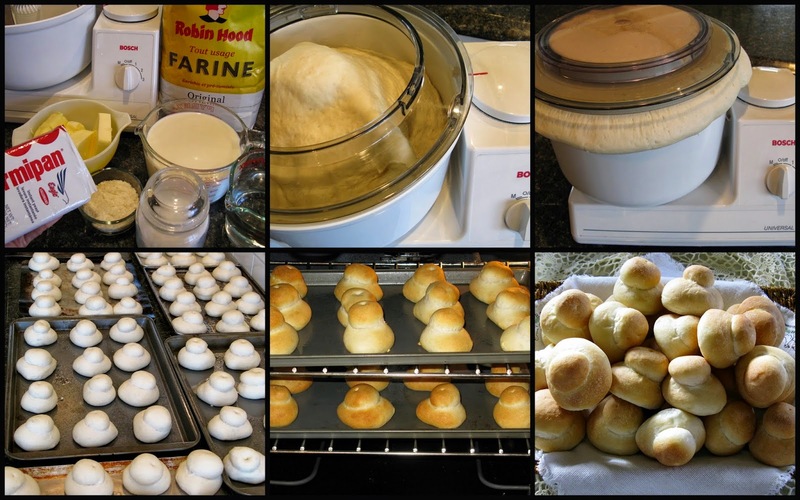 It's Flashback Friday and I am re-posting my Zwieback recipe that was first published here in December of 2008. If you are longing for the buns you once enjoyed at Grandma's table, why not try baking your own? 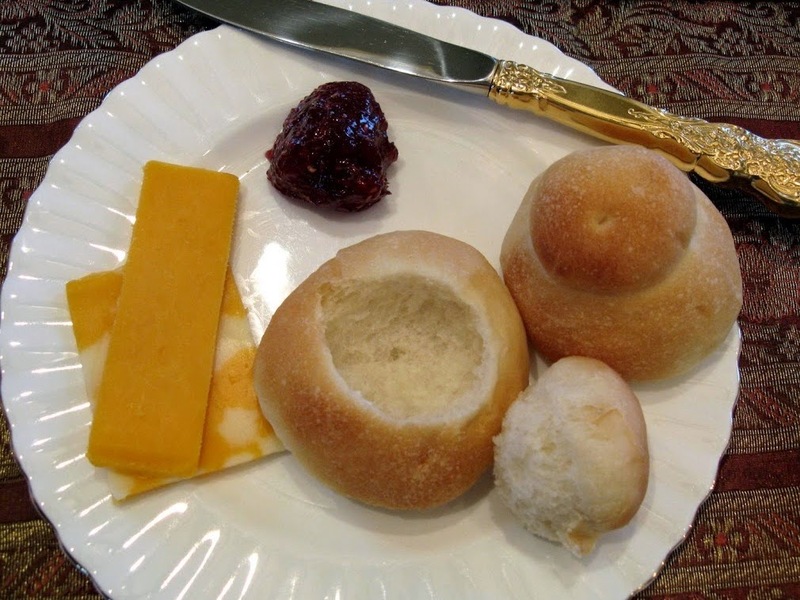 Zwieback (the Mennonite bun) are double-decker yeast rolls, that were traditionally served at every festive occasion, from Sunday afternoon Faspa to weddings and funerals. My mother-in-law made the best zwieback that were tiny, perfectly formed, melt-in-your-mouth morsels. According to her, the secret was using REAL butter. In our home, these were known as 'Grandma buns'. *I add 1/2 cup instant potato flakes to the water to make 'potato water'. Pour hot milk and potato water over butter, salt and sugar in large bowl. Let cool 5-10 minutes. Prepare yeast by dissolving 2 tsp. sugar in 1 cup water and adding yeast. Add 6 cups flour to the milk/butter mixture and beat well. Continue adding flour and mix until the dough pulls away from the sides of the bowl. Dough will be very soft. Knead about five minutes more. Form the buns. Bottom bun is about the size of a large walnut...top bun is smaller. Place smaller ball on top of larger one...and push down through centre of both balls with knuckle of index finger to prevent buns from falling over during baking. Note: Now that is the original recipe, but since I mix all my breads in the Bosch machine...it is much simpler for me than it was in ages past! I let the machine do all the kneading...and add the instant yeast* directly to the mixer with the flour. When the kneading is done...I just leave it right in the mixer bowl to rise. About 15 minutes later, the dough is ready to be formed into buns...lots of them! *Instant yeast has fine granules that don't need dissolving and is sometimes called bread machine yeast. It is made by Fermipan, Instaferm, Fleischmann's and others. This yeast can be used interchangeably with active dry yeast. Measure out the same amount of yeast and skip the water-activation step. ach du schreck...that are alot of bunns....and that fast! i am impressed! Oh your zweiback smell fantastic. . .and they look picture perfect too. ohh .. your zwiebach look great! I used to make them all the time...and they are what I miss the most being Celiac! Sigh! I checked your recipe immediately for the 'secret' ingredient and found that you have it! The salt! most people don't put enough in .. and what a difference in makes in both aroma when baking and flavour in your mouth ... my mouth is watering.. literally !! Ohhhh....those look just like my mom's buns...right down to the Royal Albert!!! But I don't think she would have ever dreamed of making them someday by machine. I wish I had one myself! Wow...Judy...I can say...your recipes always turn out so this is one to try for sure...can I do it without a machine and...are they similar to your other bun recipe I make all the time, for the meat filled buns? Those look amazing! I am going to point my son in this direction as he made wonderful homemade rolls for Thanksgiving. I'm certain that he'd be intrigued with this recipe. Mmmm zweiback, they sure are a treat! My Mom always used butter for her zweiback dough. Oh boy, I was thinking that's alot of butter, but it's a lot of Zwieback too! The butter, the potato water and scalded milk . . . these are truly Oma's buns. I'm amazed that you can fit that whole recipe in your machine. Oh, and I'm sure they were good! I love bread even more than dessert! This rolls look delicious! I love to make a lot and freeze some for a rainy day...or snowy day! These look amazing...I will be giving them a "try!" YUM YUM! Can this recipie be "halfed"? I am sure my children would love these! Your zweibach look delicious! I can hardly keep them around my house... my 19-month-old son recognizes them and begs for them when he knows I have made them... even when they are hidden in the pantry! I just found your website and LOVE it... I can't wait until I'm off from teaching for the summer so I can do more in the kitchen than just bake my bread and make my jam... there isn't much time for anything else during the busy school year!! What a treasure. I grew up in Steinbach Bakery, watching my Dad and my Grandma Toews "pinching zweibach." They both had hands and fingers like spring-steel from squeezing all that dough. Thanks for posting this connection to early (!) mornings with them at the bakery, a connection my daughters will now be able to schmeck! My mother in law added vinegar to the recipe. Have you ever heard of that? Yes I have heard of vinegar in buns. My recipe of "Air Buns" have vinegar in them, they are posted on the blog as well. They always turn out good. Tell me about potato water...I have been trying to duplicate my grandmothers recipe...she passed with out giving us her secrets! Tell me about potato water... my Mennonite grandmother passed with out sharing her secrets! Potato water is simply the water left over after having boiled potatoes. Just put in enough water to barely cover the potatoes and when they are ready, drain them through the colander into a big bowl to catch the starchy water. You can use the water to make chewy bread as well as tasty gravy. Hope that this helps. Went to the West Coast Mennonite Relief Sale & Auction this last weekend, and brought my husband, who had NEVER had zwieback bread, and couldn't understand why I was willing to stand in line...until his first taste. Then, he went back in line to buy more. He'll be happy that I found a recipe to make them at home. Is the yeast that you use regular granulated yeast or some other type of yeast? I have not heard of the brand that you used, so want to make sure that I get it right. Active dry yeast is the traditional yeast called for in this recipe...the kind that needs to be dissolved in water. I always use instant yeast (Fermipan or Instaferm are a few of the brand names) which can be added directly to the dough along with the flour. Either method works fine! Hallo!! Es ist fantastic euch hier zu finden. Ich bin Menonite aus Brasilien. Meine Oma und Opa sind aus Rusland gekommen. Wir sprechen Plattdeusch und viele Rezepte das hier sind, kochen wir heute noch hier in Brasilien: Zwieback, Pluma Moos, Honig Kuchen, Bienenstich, Nudel Suppe, Borscht, Bobbat, Schnetjie, Warenicke, Katlette, Cabbage rolls, Warenike, Rollkuchen...Wir wonnen soweit entfernent und die Rezepte sind noch dieselbe. Das ist fantastic. Liebe Grusse an euch. 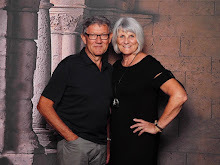 Joane Margaret Barg Spenst Hubert aus Brasilien. I know it's been a year since you posted but I grew up with so many of the dishes you mentioned: Zwieback, Pluma Moos, Bobbat, Warenicke ( a New Year tradition). My father's family immigrated from Russia in the 1800s to Mt. Lake, Minnesota. So did I! I grew up in Mountain Lake and grew up with these foods - I'm still baking Zwieback... my family won't let me stop! My Dad came to Mountain Lake from Russia at age 5, arriving around 1885. So fun to see and recall these foods! My husband Grandmother also grew/lived in Mountain Lake! He has been requesting I make Zwieback for awhile now, and I am finally getting around to doing it! She hasn't lived in Mt Lake for a while now though, and is 95 years old living in California. Her Family name is Franz if you know of anyone that went by that name let me know! I really enjoyed the freedom of expression in languages. A friend gave me your Adress and I love it! I made many of these recipes in my lifetime! I have a recipe for donuts; and if you want I can send it. I googled New Year's Cookies to see how common they were and that's how I found your blog. I lived in central Kansas as a child moving to Alabama at age 13. My Dad was "Molotsch" and my Mom "Polsh". So I grew up eating many of the foods you have here. Some of them are slightly different, but so recognisable! 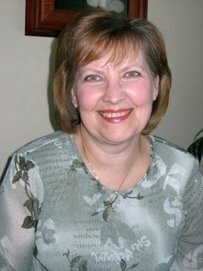 Mom passed away Jan 31. While all the family was here for the funeral, we cleaned out her house and dispersed her things among her 90+ decendants. Several of my nephews had spoke longingly of Grandma's zwiebach, so I got up early and made a huge batch and took them to her house for a morning snack. You should have seen the rush! My husband was diagnosed a celiac 4 years ago and he misses zwiebach, even tho' they were new to him when we married. I would love to surprise him with some! Please figure out a recipe---pleasey please? By the way- we always teased dad and mom that the 1 thing we'd never forgive them for was not teaching us 'dutch'. That's what they talked when they didn't want us to understand! I will be checking your blog regularly and trying recipes, especially the gluten-free ones! I lost my recipe for Zwieback and this one looks pretty close. Only difference is when I learned to make them (from an older lady at the mennonite brethren church I went to when I got marries)instead of butter she used oil and a scoop of the fat skimmed from the making chicken soup! The flavour was out of this WORLD! I'm going to try this recipe using the oil and chicken grease in place of the butter, I think it will be pretty darn close to my lost recipe! A family member used to use chicken fat and I saved mine from the whole chickens I bought and froze it for her. I've never tried using chicken fat in them, but her zwiebach were light and fluffy. These look delish ... want to make them in my new ninja dough bowl. Hope it works as well as your Bosch. Will start with 1/2 of the recipe. That sounds tasty and pretty easy, Judy! Thank you! So, I want to be sure....in the original recipe it was traditional/slow acting yeast, but now you use fast acting yeast? So you skip the step of proofing the yeast and just add it in? Thank you! The recipe is still printed as it always was...using the traditional yeast that needs to be proofed. But I find that if I use the instant yeast (same amount) in my mixer, I can just skip that step. So...take your pick! Judy this is the same as the recipe my MIL gave me and I've been making them ever since. They make up so quickly that you can have fresh buns in under 2 hours. You can also halve the recipe if you think you won't need so many buns but they freeze beautifully. My recipe is about 1/4 the one you suggest and, I so agree, that butter, enough salt and definitely a significant amount of sugar are "key" to a cloud light roll. My 20 y.o. grandson requests these at every family gathering (I threatened to start wrapping some up as birthday and Christmas gifts.....he thought that would be excellent!)!!!! We just had some of the buns I made this afternoon with our supper tonight!!!! Oh Judy - those buns look perfect. I've only tried to make these once but must do so again. I love adopting your kind of Mennonite specialties! I had to giggle out loud when I read the first comment by Charlotte - Ach du Schreck!!! Happy New Year to you and yours Judy! Just remember that if you decide to use the instant yeast, you must still add the water called for in the recipe that you would have used to dissolve the traditional yeast. Sometimes users forget to add it and the bread or rolls are not as moist. I love instant yeast and all your recipes! When my mother married her third husband at the age of 82, she wanted zwiebach for the Mennonite side, and Swedish meatballs for her Swedish heritage. His daughters didn't want to make the zwiebach, so I got a recipe from a good friend of mother's, Rosie Nickel, and made 15 dozen (larger than yours), plus all the meatballs, for the reception. Rosie's recipe is just like yours except she used oil. Next time I make these, I'll use butter as well as it's more healthful. Hubby and I don't eat much bread, so I have to have lots of guests at a dinner party to make these. I also have a Bosch machine and use it for all my breads. I've made these a number of times....what's your trick to keeping the "heads" on? The trick is in using your index finger knuckle (some use their thumb) to press the top ball of dough into the bottom one. This make a 'dimple' in the middle of the zwieback and prevents the top from sliding off while in the oven. I hope this isn't a dumb question, but what do you do about all the "leftover" dough (either already shaped or still in the bowl) while one set of buns is baking? It just keeps rising and rising. I don't want to let it overproof. Not a dumb question at all. I have plenty of pans so I form all the dough into buns at once. If you find this is too large a recipe, just halve all the ingredients. You can also put dough into the refrigerator in a sealed container to be shaped into rolls later. All the best. Thanks for your reply! I am doing some mad scientist experiments in my kitchen with various enzymes, hydrocolloids, etc in order to make gluten free dough that is actually dough and not a batter (or close to it) so I can convert it to a zwieback recipe. I reeeeeeeally miss zwieback!! !